Leigh Muñoz is an avid entrepreneur, orchestral musician, and artist-teacher and she brings a variety of experiences to her career. Leigh is the founder and owner of GoBassoon Reeds, which provides professionals, amateurs and students from around the world with thousands of bassoon and contrabassoon reeds every year. In demand as a clinician, she has spread her knowledge of reed making throughout the country. Leigh is the Assistant Teaching Professor of Bassoon at the University of Missouri and is on the faculty for the Bassoon Institute at Interlochen Arts Camp. She previously taught at High Plains Music Camp and the Midwestern Music Academy. 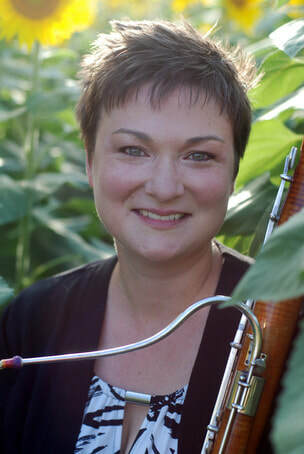 Prior to her appointment at the University of Missouri, Leigh has held bassoon teaching positions at Washburn University and Missouri State University. Leigh currently performs with the Symphony of Northwest Arkansas (SoNA). She has held contrabassoon positions in both the Springfield and Cedar Rapids Symphonies and is currently a regular substitute bassoonist and contrabassoonist with the Kansas City Symphony, Lyric Opera, and Kansas City Ballet. Leigh has performed as concerto soloist with the University of Missouri Wind Ensemble, University of Missouri Philharmonic Orchestra, University of Kansas Wind Ensemble, University of Kansas Symphony Orchestra, Ottawa University Symphony Orchestra and Ohio University Symphony Orchestra. Also an active member of the double reed community, Leigh has both performed and given reed making clinics at multiple Midwest Double Reed Society Conferences and is currently their Web Editor and has served in the past as their Treasurer. She has also been selected twice to perform world premieres at the International Double Reed Society Conferences. Leigh holds degrees from Oberlin Conservatory, Ohio University and a Performance Diploma from New England Conservatory. Her principal teachers include George Sakakeeny, Eric Stomberg, and Richard Svoboda. © COPYRIGHT Leigh Muñoz 2017. ALL RIGHTS RESERVED.